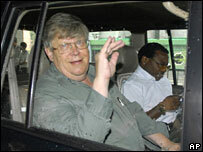 A team of UN nuclear inspectors is heading to a North Korean reactor at the centre of a key disarmament deal. It will be the first international monitoring team to be given access to the Yongbyon plant since 2002. Analysts say the move shows the North Koreans are serious about a pledge to "shut down and seal" the reactor. But in a sign the North remains anxious to prove its bargaining power, it tested a ballistic missile on Wednesday - the fourth such test since early May. Japanese Prime Minister Shinzo Abe criticised the short-range missile launch, calling it a provocation that defied the UN, and could destabilise the region. The White House said it was "deeply troubled" by the move, which happened at a "delicate time" in international negotiations over North Korea's nuclear decommissioning. The four-person International Atomic Energy Agency (IAEA) team is hoping to spend most of Thursday and Friday at the Yongbyon site. 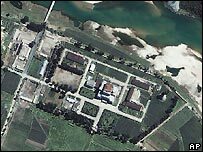 The plant, about 100km (65 miles) north of Pyongyang, is thought to be in a heavily guarded area defended by anti-aircraft positions, and the compound houses over 100 buildings. Monitoring officials were expelled from Yongbyon in December 2002, after which the reactor went into operation, allegedly producing enough plutonium for up to 12 nuclear devices. But under an international deal agreed in February, the North agreed to "shut down and seal" the reactor in exchange for international aid. Before leaving Pyongyang on Thursday, the head of the mission, Olli Heinonen, said he was optimistic about the nuclear reactor being closed down. He said that discussions with North Korean officials would focus on the procedures for decommissioning the reactor. "We are here to talk about the verification and monitoring arrangement," he said. However, Mr Heinonen added that it was too early to comment on which facilities could form part of the initial decommissioning process. Once agreement has been reached on the procedures, the IAEA is expected to send a new team of inspectors to observe the shut-down.